This is just for my reference: I keep forgetting the cool tricks to using Google and handy Windows shortcuts, so I'm going to annotate them here and update them as I learn more. The combination of two decades (ages 18−37) of reckless eating habits with little exercise (after 1991), plus my metabolism slowing down around my mid-30s, has developed an unsightly paunch on me. I dress to hide it, or I tell myself I do and everyone else is too polite to confess they detect the illusion, but when I change for bed or shower there's no hiding my unsightliness from myself. I'm sure making my own beer hasn't helped things. Belly fat is linked with cardiovascular disease, diabetes, and cancer. Specifically it's the deepest layer of belly fat —the fat you can't see or grab — that poses health risks. That's because these "visceral" fat cells actually produce hormones and other substances that can affect your health (e.g. increased insulin resistance and/or breast cancer risk). The fact that they're located right next to and in between organs in your abdominal cavity doesn't help. For example, fat next to the liver drains into it, causing a fatty liver, which is a risk factor for insulin resistance, setting the stage for Type 2 diabetes. From Wikipedia: There is a strong correlation between central obesity and cardiovascular disease. Abdominal obesity is not confined only to the elderly and obese subjects. Abdominal obesity has been linked to Alzheimer's Disease as well as other metabolic and vascular diseases. 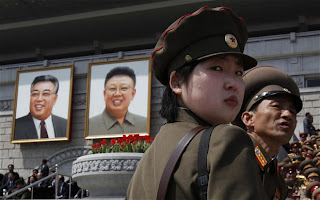 The tyrannical state of North Korea is often described as a "blind spot" or a dark region of unknowns, within the context of the global theater. Even places where Americans aren't allowed or encouraged to go—Burma, Cuba, etc.—are still open to research and visuals. North Korea takes great pains to block out all outgoing information and preclude all incoming information. This is impossible, of course. The popular saying "information wants to be free" has no greater poster child for its campaign than the North Korean population. Within the last few years, defection rate has kicked up to 1,000-3,000 people annually, from only a few hundred per year in the '90s. What has made people so confident to break free and seek refuge elsewhere is the amount of information that has seeped through North Korea's borders. The totalitarian regime itself has inadvertently cultivated an apt audience: through mismanagement, pride, and gibbering insanity, the ruling family in Pyongyang has cut off international trade and refused emergency fuel supplies. Factories cannot run when electricity only turns on twice a year (to observe Kim Il-sung's and Kim Jong-il's birthdays), so they collapse and are stripped for parts. It is mandatory for workers to show up for the workday, even when there's nothing to do, and their food rations have been scaled back to unsustainable amounts. This has stoked resentment and desperation in the working class. Tonight, my wife told me about Sen. Amy Klobuchar's support of the Keystone XL pipeline. I had to write to her and express my objection, for all the good that will do. Speaking as a long-time fan of your career, I cannot adequately convey my horror at your inexplicable support of the Keystone XL pipeline. Many respectable and authoritative scientists have characterized this project as a "game over" move for the environment. To support the dubious short-term gains from a questionable cross-continental pipeline and the energy-intensive extraction process to glean oil from shale betrays a cavalier disregard for the Canadian and U.S. environmental systems, not to mention a tacit snub of cleaner or alternative power efforts. What could be the possible justification of supporting such a disastrous and ill-advised pipeline project? The motivations can only be political, and therefore far from transparent to your tax-paying constituency, because no one with a responsible and cognizant advisory panel could be led to think this is a good idea. I'm heartbroken over your betrayal, whether naive or hypocritically driven, of the interests and welfare of every citizen in your state, not to mention the communities that stand to be disrupted all along the path of the pipeline. Even now, the oil companies are exploring legal loopholes to abnegate themselves of the responsibility to the farmers and families whose livelihood construction of the pipeline will irrevocably disrupt. And on the larger scale, as the global average temperatures rise, as thousands of species die, as this Keystone bandaid deludes people into thinking there's no need to abate their increasing consumption of fossil fuels, I'm afraid you will be reckoned on the wrong side of history. This is worse than throwing your constituency under the bus. This is much more drastic than merely letting someone down. Your support of the Keystone XL pipeline is a denial of responsible, substantiated climate science and the considered opinions of qualified experts. I'm embarrassed that the most potent response at my disposal is merely to withdraw my support for you, but what else can a reasonable person do? All right, I've got to straighten something out. I did some research and I found a pretty good source that fell short on a couple points, so I'm going to post a correction. My workplace is pretty awesome. We had a nice Christmas party dinner at a retro steak club; we had a pajama party; we have a delightful happy hour each Friday, right in our own kitchen, featuring the best of craft beer and scotch. Tomorrow we're having a St. Paddy's Day all-green potluck lunch. (I don't know why it's on the 13th instead of the workday closest to the weekend, Friday the 15th, but so it is.) The office was given a list of items to sign up for, and I chose Jell-o® shots. I'm sure they hate being associated with party booze mixes, but what can you do? Money is money, and an all-sugar product can't pretend to be concerned with health issues. I wanted to look up a really special recipe for Jell-o® shots, and I found one: the Lucky-Tini at "Jelly Shot Test Kitchen." 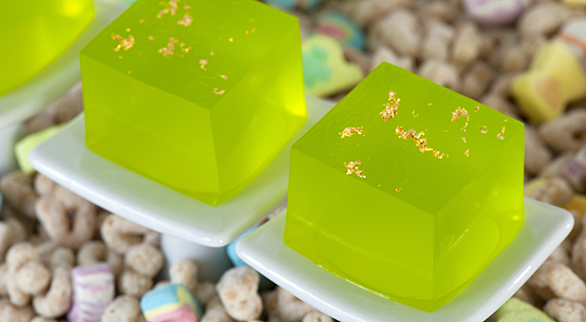 I found that site by searching for "jello shot recipe" and probably throwing in "St. Patrick's Day green" for good measure, and Google coughed up a slew of Pinterest accounts, so I switched to Google Images and picked the nicest-looking Jell-o® shot. I decided to grow some plants. They provide a nominal amount of oxygen and absorb CO2, and some plants you can eat. Fortunately, the Internet is foggy with how-to's and DIYs on this topic, so a reader of market perspicacity can read a dozen articles, assimilate and crystalize the salient points, and set to work. That's what I did, anyway. 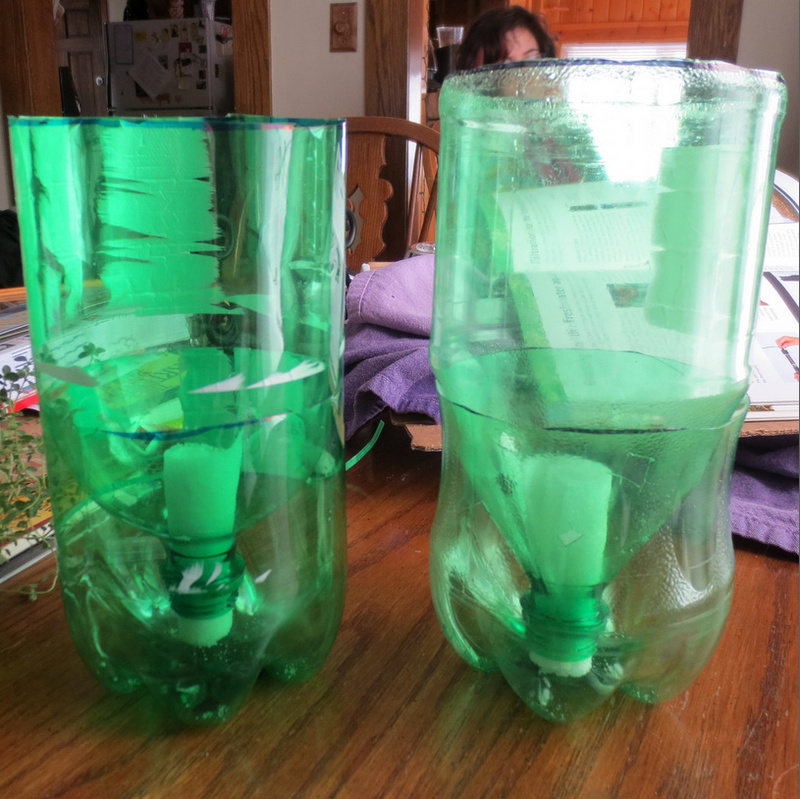 This project involved turning 2-liter soda bottles into planters. That was the first problem: I don't drink soda. I don't drink cans, and I definitely don't drink 2-liter bottles. There is nothing healthful about soda in the first place, and then people drink it instead of water, milk or juice, generating hypertension, obesity and type II diabetes in themselves, placing an emotional burden upon people who care about them and a financial burden upon the health care industry. And when you try to explain this to them, they double-down on their ignorance and ridicule you for being a Debbie-downer or a health freak, lashing out at anything or anyone that threatens their addiction to junk food. So where was I going to get a 2-liter bottle? As it happened, there were some parties in my social circles within the recent past and we were asked to provide beverages. So I bought some 2-liter bottles of soda for drink mixers, people used what they needed, I discarded the rest, et voila: planters. Many of the instructions start out the same: you can take a can of soup or beans and stand it next to the 2-liter bottle. Using a Sharpie or other permanent marker, trace a circle around the 2-liter bottle using the top of the can as a line guide: brilliant in its simplicity. After that, use a very sharp pair of scissors or a good X-acto knife to cut along the line in the bottle. The importance of this technique is to halve the bottle but to ensure a ratio: you will turn the top half of the bottle upside down and place it in the bottom half, but you don't want the neck of the bottle to bump up against or lie flush with the bottom of the bottle. This resourceful can-measuring technique works around that most handily. 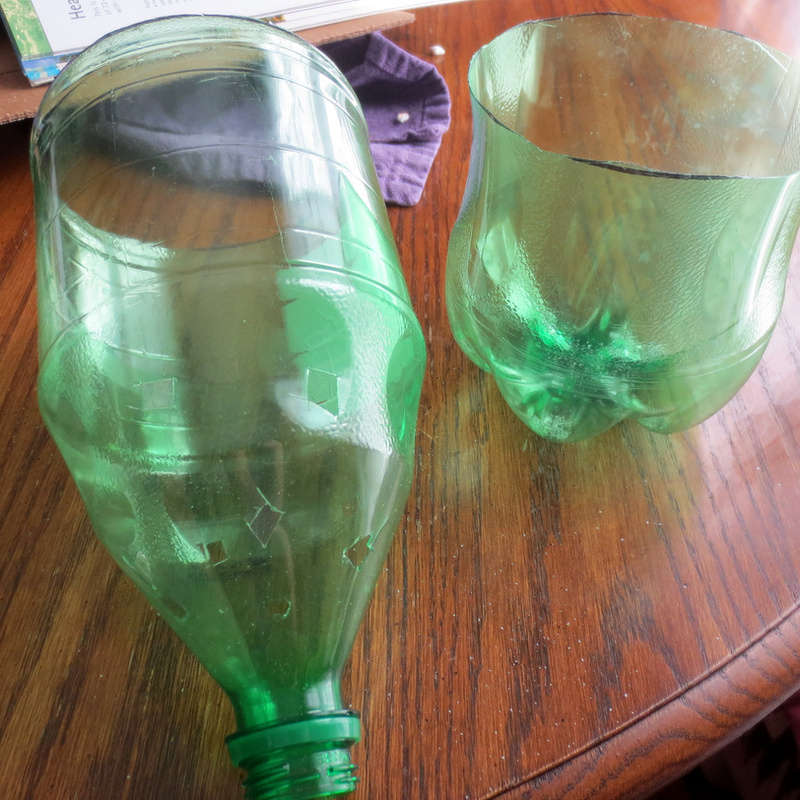 The next thing to do is to puncture some holes in the top half of the 2-liter bottle. Again, there are many clever ways to do this: a slim, sharp pair of scissors, a good X-acto knife, heat up a metal chopstick or nail with a candle flame and melt holes into the plastic... The sky's the limit. You will doubtlessly find your own great idea to achieve this effect. The function of these holes is to allow the soil to rest in the top half of the bottle while exposing it to some measure of water. The bottom half of the bottle will be filled with water at all times, of course, and two rings of four to six holes will suffice for this purpose. You don't want all the soil dumping through the neck of the bottle, of course, so that brings us to our next step. Many DIY instructions have their own technique for handling this, so please choose the one that you find most accessible or actionable. You can save the bottle cap and make a small puncture in it, through which you will run some string, twine, or yarn—the point, ultimately, is to create a hydrating wick that will carry water from the reservoir up into the soil. Anything will do this, and the instructions I found initially (but can't find again) suggested using quilt batting, and using this does not require retaining the bottle cap. 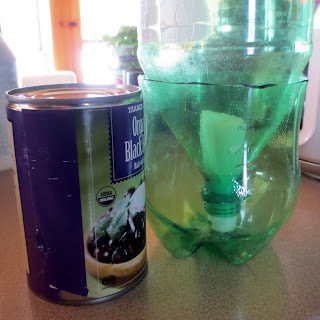 You can plug up the neck of the bottle and an abundance of water will transfer up into the soil. Well, I went out to Bachman's and I forgot all about the word "batting," so I fought through throngs of customers for their weekend sale and farmer's market to find someone at a desk to help me. What I described to him was a hydration or irrigation wick, and he looked baffled for a moment. I tried to describe what I was doing as clearly as possible (but Horace said, Brevis esse laboro, obscurus fio) and he started to grasp the concept but didn't think there was anything in his jurisdiction that would effect it. We asked another guy in another department and he said they used to carry it, maybe a few months ago, but didn't have it now; he suggested shopping for hydration wicks online. Ultimately, I found a strange substance called WaterStor which looks like small plastic woven squares, until you take them out of the little bag and they scatter particulate all over. Didn't care for that, but it's designed to retain water and slowly distribute it into plant soil, like a kind of slow-release water bank. My hope is that it will also work as a wick (and if not, I'll consider it a $5 donation to science). Two sheets, rolled up, just fit inside the neck of a 2-liter bottle and that's good enough for me. At Bachman's I picked up two small herb plants, having had the good fortune to find an available staff and ask her what was hardy and easy to grow indoors. 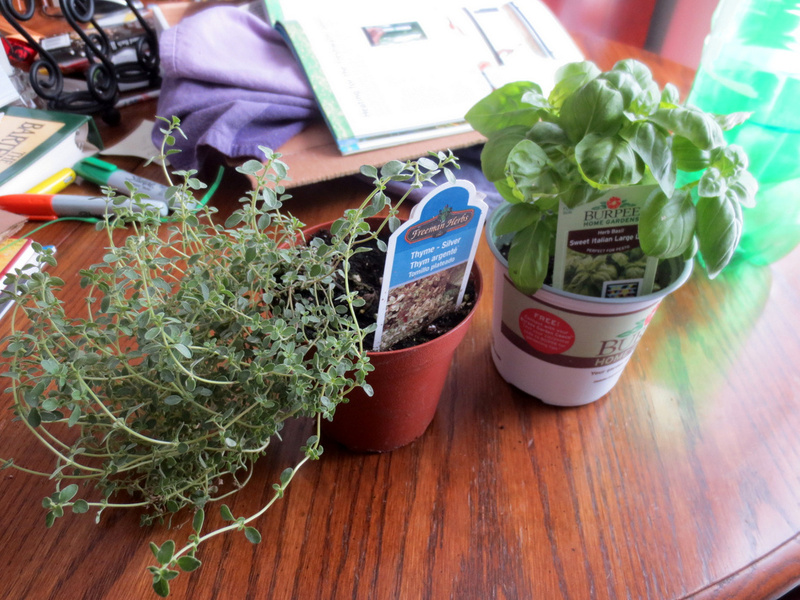 Based on her recommendations I picked up sweet Italian large-leaf basil and silver thyme. They smell wonderful and they'll go into food we're already making for ourselves, which I hope will be a nice addition. I'm thinking about some kind of structure to deter our curious and obnoxious cats from killing these lovely specimina, but it's just as likely they won't care in the first place. The next thing we have to do is walk down to ACE Hardware and pick up "mixed soil." All the DIY instructions call for mixed soil specifically and in contrast with potting soil. My hypothesis is that mixed soil has a blend of components that amateur growers like myself find beneficial for raising plants indoors. And these will be indoors, sitting in the windows to absorb as much sunlight as makes itself available. I also have plans to construct a grow-light trellis, however, with red, white and blue LED bulbs that should—if cursory research serves—provide a sufficiently full spectrum of light by which to nourish the plants. That will be another project and I will document that just as diligently. I haven't written in here forever. I haven't had anything to say. But I've had this tab open in my browser for a very long time. It's an article on BuzzFeed, 39 DIY Gifts You'd Actually Want to Receive, by Alanna Okun, because I've wanted to remark upon it to someone. However, I don't have visitors, and my commentary might start a fight, so I'm just going to complain here where nobody will see it. Let's start with the title of this article. It's insulting because it presumes that do-it-yourself (DIY) crafts are inherently repulsive or undesirable. The title suggests that despite the fact these gifts are DIY, they have other qualities that counteract this negative aspect. Unlikely as it may seem, given their DIY nature, a reasonable, mature person might somehow be interested in the items selected in this list. That's insulting because the DIY ethic should be encouraged. Consumerism is a mental disease and infinite growth economy is a very dangerous fallacy. These philosophies encourage greed, hoarding, materialism, unhealthful competition, envy/jealousy and paranoia. They do not contribute to communities and social relationships, and they impress a heavy burden upon environmental concerns at every level. Conversely, people relearning self-sufficiency is a useful step toward emergency preparedness. People learning how to better their dexterity and cognition by hands-on crafts should be encouraged, not derided. 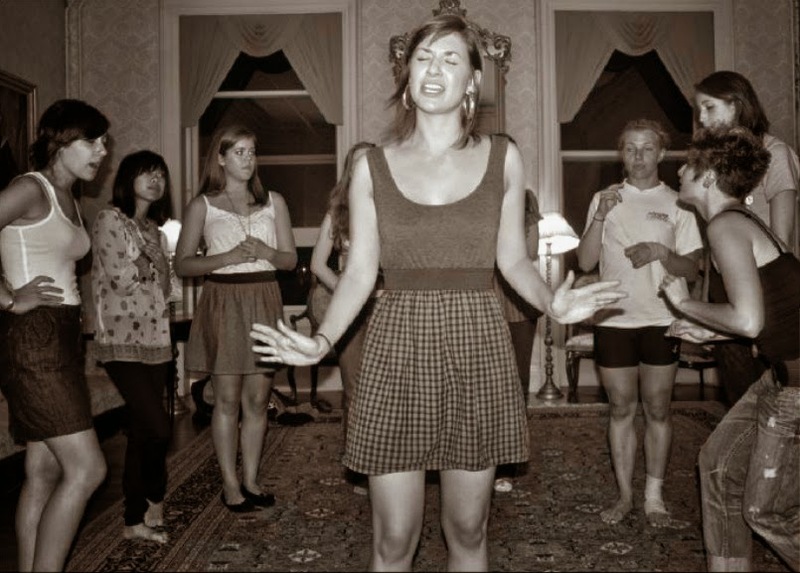 Exercises and activities that support people exploring creative expression and crafting items for their household or gifts for others are beneficial to people and communities. Ms. Okun believes that making things with your hands is deserving of insult, and that purchasing mass-manufactured crap from a corporate behemoth is the superior decision.